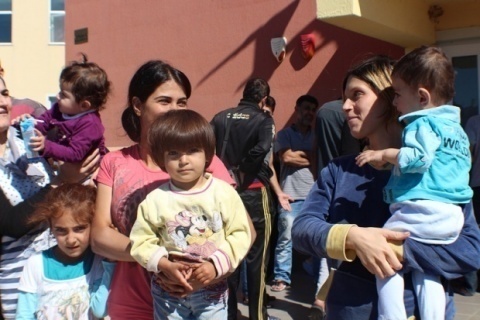 Scores of refugees, accommodated at a camp in the town of Harmanli, have reportedly gone on hunger strike against the miserable conditions, joining the protests at Busmantsi detention facility near Sofia and the town of Lyubimets. The protesters complain of lack of information, strained relations with security guards and dilapidated equipment, Dnevnik daily reported. The refugee camp in the town of Harmanli is notorious for its harsh conditions. New arrivals here live as squatters in a makeshift trailer park and are forced to brave low winter temperatures with only outdoor fires to keep them warm. A woman, accommodated at the camp, complained of violent actions by the police, who tried to disperse their protests. In her words the security guards treat the refugees like animals, regardless of gender. She said they have neither food, nor information about what is going to happen with them. Persons accommodated at Registration-and-Reception Centres of the State Agency for Refugees are free to come and go, which is not the case at the Lyubimets and Busmantsi detention centers, where persons pending deportation are also held. Being a member of the EU but not of the Schengen area, Bulgaria is just a transit county for illegal immigrant.All asylum applicants in Bulgaria are poor and somewhat confused and the country is rarely their end goal. Some 1000 persons apply for asylum each year, mainly from Afghanistan, Iraq, Armenia, Iran, and most recently, from Africa and Syria. However, on average no more than 10% get political asylum, while the remaining ones may spend years roaming through the local red-tape labyrinths before they decide to head off to Western Europe, often again illegally. The imperfections of the legal system (one asylum-seeker can file an indefinite number of applications), combined with the insufficient administrative capacity, enable the formation of a community of people without documents whose stay in the country has expired.